Every year, when autumn rolls around, I want to go on retreat. Maybe it’s the smell of the autumn leaves clothed in brilliance, dancing down to earth, or maybe it’s the crisp air and waning light. Autumn is a feast for the senses, and God’s handiwork is apparent everywhere. Yet, every year without fail, autumn proves a time too busy to get away, even for a weekend. School has just begun, sports are in full swing, work ramps up, and the holidays are fast arriving. This year, though, I find myself determined to grasp some time and step back from the daily busy-ness even if I can’t yet get away for a week or even a weekend. October is a perfect month to make time for silent recollection, review the year, and prepare purposefully and prayerfully for the coming of Advent and the Christmas season. St. Ignatius knew from experience that making time and space for God is critical to the spiritual life. Some of his most powerful mystical experiences occurred while he was away from routine daily activities and was enveloped in silence—take for instance his long convalescence or his time at Manresa. In fact, Ignatius considered making time and space for God so important that he required that his followers make a full, silent retreat each year accompanied by his guidance in the Spiritual Exercises. Making a yearly retreat is of critical importance in the spiritual life. However, if you’re not able to take a full 30 days, or even two, to go on retreat right now, here are three ways to cultivate a retreat state of mind until you do have time to get away. Plan your own retreat day. Block it off on your calendar, and consider it a real commitment. Don’t budge! Find a quiet, peaceful location—I prefer those places that just feel like “holy ground” like a monastery, convent, or church with quiet grounds for walking—but the ocean, river, and mountains often feel like holy ground to me too! Turn off the ringer on your phone and disconnect from all media. Before you go, plan out your day: you might schedule time to pray with Scripture, for spiritual reading, to recollect the events of the year with the Examen, to prayerfully prepare for Advent and Christmas, to journal, to walk in prayerful conversation with God, and to practice centering prayer or meditation. As you savor the silence and stillness, ponder Ignatius’ concept of “God in all things”—it’s not hard to do when you are surrounded by the beauty of nature! If you are at a church or monastery, spend time with Jesus in the Eucharist, at Mass or at Adoration. Whatever moves you to prayer and praise, include that in your schedule. Make a “micro-retreat.” You don’t have a full day? Me neither! So make it a micro-retreat. Take three or four hours and find some holy ground just as you would if you had a full day. Focus on just three or four activities from the full-day options. Go for a prayerful drive: preferably to a scenic place where there is not a lot of traffic. As you soak in the beauty of the leaves, sky, mountains, or shore, give thanks to God. 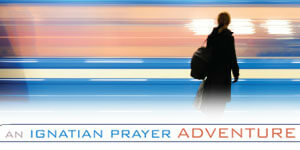 Devote the entire drive time to prayerful conversation with God. You may want to use the Examen to guide your conversation. Come, You Spirit of Quiet. Come You Spirit of Breath, breathe your breath into my thoughts, into my feelings. Come and take your place in me. My Lord and my God, take from me everything that distances me from you. My Lord and my God, give me everything that brings me closer to you. Finally, schedule that retreat! Now is the time to look ahead in your schedule and reserve time this winter, spring, or summer. If you live in the U.S., you might find this handy map of Jesuit retreat houses helpful. These are just some ideas of ways you can spend some peaceful and prayerful time with God this autumn if you don’t have the time to go on retreat. What are some other ways you might make time and space to spend with God this autumn? Editor’s note: Another option for spending time with God this autumn is through an online retreat. Taste and See: Experiencing God with Our Senses is a free online retreat by author Ginny Kubitz Moyer. Hi, I just read your article that went out today where you had a link to all the Jesuit retreat centers in the US. I wanted to let you know that in Miami there’s also one, it’s Casa Manresa. Their phone number is 305-596-0001.